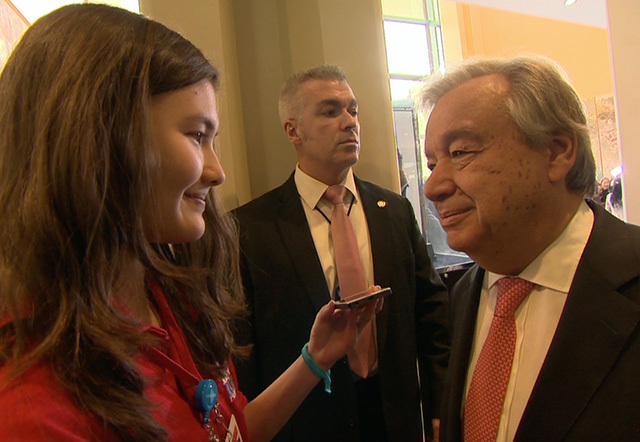 World Children’s Day | Kid Reporters' Notebook | Scholastic Inc.
Click below to see clips from Charlotte’s interview with UN Secretary General António Guterres. On November 20, UNICEF hosted World Children’s Day at the United Nations (UN) in New York City. UNICEF, which is short for United Nations Children’s Fund, aids vulnerable children in developing countries. This year, the organization invited kids around the world to “take over” key roles in government, business, and the media. At the UN, young people addressed diplomats from several countries. Charlotte interviews UN Secretary General António Guterres. World Children’s Day was established in 1959. This year marks the 28th anniversary of the adoption of the UN’s Convention on the Rights of the Child. The document details the rights to which children around the world are entitled. This was the first year that UNICEF hosted a gathering with kids at UN headquarters. Kids from around the world journeyed to New York to discuss ways to improve life for vulnerable children. In a vast assembly hall, which was filled with both kids and world leaders, young activists shared their stories. Eleven-year-old Nance, whose family fled Syria after a civil war broke out, now lives in the United States. She hopes to be an optometrist when she grows up.